BMW 5 Series Touring Performance, Engine, Ride, Handling | What Car? 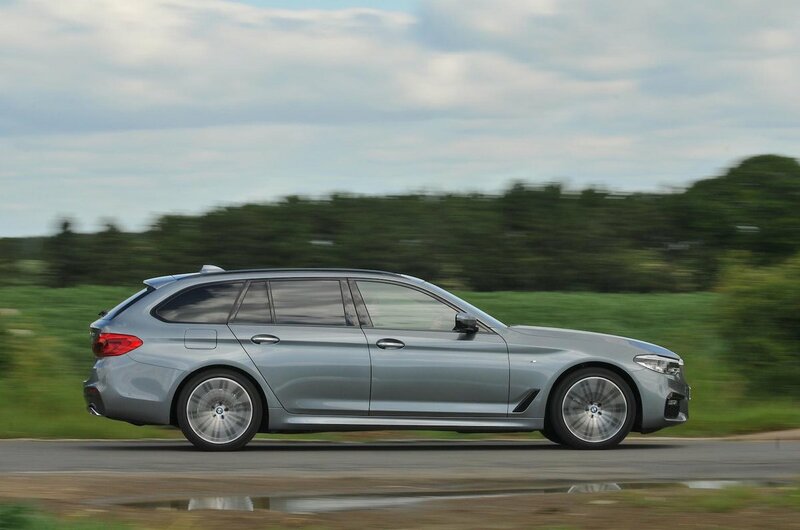 The 5 Series Touring’s performance is every bit as impressive as its saloon stablemate. Our choice is the 187bhp 2.0-litre 520d diesel, which blends frugality with more than enough pace to haul along you and a fully loaded car with ease. It’s an eager beaver sprinting away from a standstill and will whiz you up to motorway speeds from low revs without complaint. That said, you'll have an even more fabulous experience if you go for the 261bhp 3.0-litre six-cylinder 530d diesel. It's inherently smoother than the four-cylinder 520d and displays a near-instantaneous muscularity across its rev range that even the talented 520d can't match. But it is more expensive. There is also a brace of petrols, comprising two 2.0-litre four-cylinder motors of 182bhp in the 520i and 249bhp in the 530i, plus a 540i with a sweet 335bhp 3.0-litre six-cylinder that can speed you from rest to 62mph in just 5.1sec. All engines are paired with BMW's eight-speed automatic gearbox that flicks swiftly between gears on its own and responds promptly to the manual paddles behind the steering wheel. 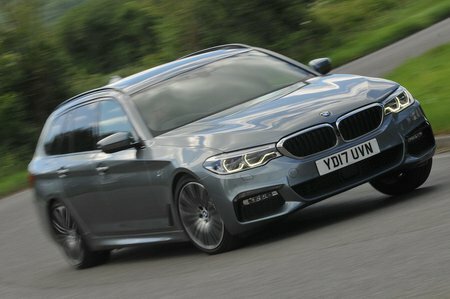 The way the 5 Series Touring rides depends largely on whether you specify the standard suspension, the stiffer M Sport set-up or do what we’d suggest and tick the box for the optional Variable Damper Control (VDC) adaptive damping. It's not cheap, but definitely worth the extra. Without it, the 5 Series Touring is supple enough over big bumps around town, but there’s always an underlying shimmy through the car on anything other than super-smooth roads, particularly if you opt for 19in alloys, M Sport suspension or run-flat tyres. If you do lots of motorway miles, you’ll probably find this quite annoying. Cars with VDC, however, are even more forgiving at low speeds and they ride in a much more sophisticated fashion along pockmarked British A-roads and motorways – especially if you soften the dampers by pressing the Comfort button next to the gearlever. And the good news is that the settings are the same whether you opt for SE or M Sport trim. It’s worth pointing out that all its rivals, including the Mercedes-Benz E-Class Estate and Volvo V90, also need an equivalent form of pricey adaptive suspension fitted to achieve their best ride quality. One word of warning: if you do spend the money on VDC, don’t undo all its goodness by specifying really big alloys or run-flat tyres. The 5 Series Touring has considerable dynamic prowess – it’s better in the bends than an Audi A6 and up there with the E-Class and V90 – but it’s not quite as scintillating to scythe through corners as the sweet-handling Jaguar XF Sportbrake or even the lighter 5 Series Saloon. All models feel well balanced, while xDrive versions with four-wheel drive have tremendous traction, even in poor weather conditions. Switch to the firmer, more responsive Sport mode and the 5 Series Touring’s steering feels more consistently weighted and precise, and there's genuine enjoyment to be had flowing the car from one corner to the next. But when pushed to its limits, those front tyres want to wash wide sooner than the saloon’s. Adaptive dampers are an optional extra that allow you to firm up the suspension. This reduces body roll during hard cornering and makes the car keener to switch direction. You can also get rear-wheel steering as an option that brings a few advantages: at low to medium speeds the rear wheels turn in the opposite direction to those at the front, reducing the turning circle and making the car easier to park, plus improving the feeling of agility in corners; at higher speeds, they turn in the same direction to the front wheels, helping high-speed stability. There’s a slight diesel gruffness to the four-cylinder 520d compared with an A6 2.0 TDI, but besides that it’s much quieter than a V90 at idle or an E220d if you’re accelerating hard. It transmits no perceptible vibration to annoyingly buzz through the controls, either. However, the six-cylinder 530d diesel is an even nicer companion. It sounds smoother and pleasantly throatier than the 520d. Happily, the 5 Series Touring is exceptional at keeping road and wind noise outside, meaning long motorway journeys are never taxing. Just remember that bigger wheels will generate more road roar than smaller items.